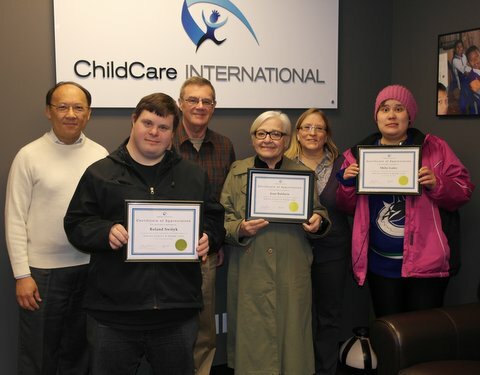 This year, participants of our recycling program raised a record breaking $2,000 for ChildCare International, representing a 25% increase over the $1500 that was donated last year. “It was the largest amount we’ve ever raised in the eight years we’ve been doing this,” says Joan Baldwin, Personal Development Worker at Semiahmoo House Society. The donation will help provide support for Gemima and Nadege, the two Haitian girls with special needs that our Eco-Heroes sponsor through CCI. In recognition, CCI staff presented participants of the recycling program framed certificates of appreciation. Our Eco-Heroes collected and recycled containers from a growing number of donors on the Semiahmoo Peninsula, including Semiahmoo House Society, Southridge School and White Rock Players Club. “We’ve just added Small Ritual Coffee Society [to our collection route] and we’re always looking for more donations,” says Joan. “We worked very hard on achieving our goal of $2000. Kristen and I are very proud of our group, the hard work they do and the heartfelt common goal of continued support for Nadege and Gemima,” says Joan. Help our Eco-Heroes make an even bigger difference next year to children in need by donating your recyclables. Pick-up days are Monday afternoon and Thursday mornings. For more information, please contact Joan at j.baldwin@shbc.ca or Kristen at k.smith@shsbc.ca or call 604-536-242. For more information about sponsoring a child through CCI, please go to http://childcareinternational.ca or contact info@childareinternational.ca.